Chaat is a Hindi word and it looks like potpourri of many many things. Just imagine that you are in heaven and you wish to have something mouthwatering, delicious, spicy, crispy, savoury and sweet ! Probably God will present “Chaat” before you, it might be a household name in India but it’s tasty as hell. Chaat is my all time favourite evening time snack, you can easily find it on road side stalls at streets, its a purely street food. Have you ever thought that you can enjoy this yummy chaat during Fasting or vrats? No right? Here I am presenting you the delicious chaat recipes which you can enjoy during vrat in Navratri. 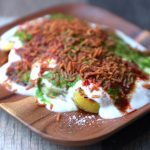 This recipe is totally farali chaat recipe and it will let you enjoy during fasts as well. 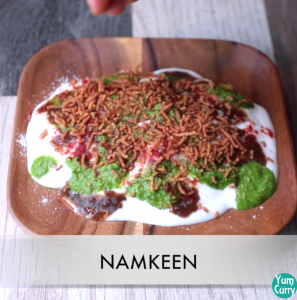 To make this yummy farali chaat or vrat ki chaat, I have used singhara namken (which you can consume in vrat), aloo tikki, green chutney, tamarind chutney and some spices. During shopping and outing, it is common to hit the road for having chaat, even now you can find western food like pizza, burger stall at road side. The only concern while having street food is hygiene factor so you might wander and check few malls and restaurants also started serving street food inside. These foods are good in hygiene and good for use. In my childhood specially on Sunday’s our best hangout place is chaopati, chaopati is place where you can find array of street foods and we enjoy having chaat and other street foods there, those are my best memories.“Chaaat” – well word is just enough to fire up my tastebuds , I will probably wake up in night and start searching around. 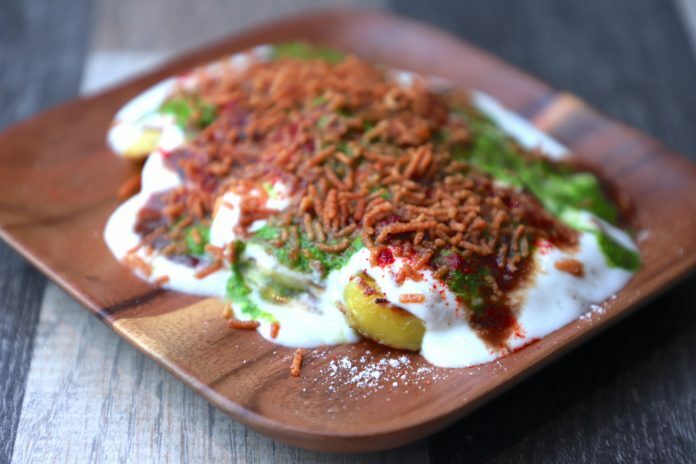 There are varieties of chaat’s available in the market, Aloo chaat(Potato chaat), Papadi chaat, samosa chaat, kachori chaat and so on, i enjoy aloo chaat most. 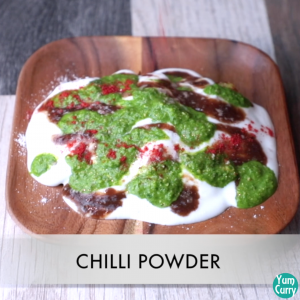 There are lot of spicy put in to chaat, chaat masala, curd, onion, coriander, chili powder, tamarind chutney, green chutney some of the common ingredient use in any chaat. Chaat masala is the mixture of cumin, black salt, black pepper, dried mango powder, dried ginger power, red chilli. So chat is also have taste of all these spices.i always keep chaat masala in my pantry. It can add life to any boring food. Here I am sharing Aloo chaat recipe that you can enjoy during Vrat or fast. 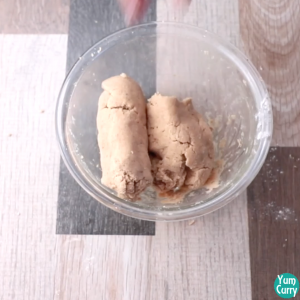 Because this recipe for Vrat, I avoid use of chaat masala and used only species that are allowed during fast. I have also made some more recipes for vrat or fast specially for Navratri in my navratri recipe collection which includes recipes such as coconut barfi, khajur barfi, milk peda for dessert. And singhara pakora, kuttu paratha, sabudana khichadi and sabudana vadafor savoury food. 1. while making sev use grater to mash the potato so that mixture can easily pass through the small holes of disc of sev maker. 2. We are adding good amount of potatoes, boiled potato is high in moisture so add water carefully while making the dough. 3. Grease the sev maker before placing dough inside. 4. 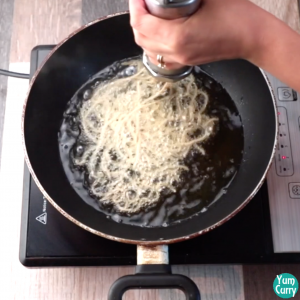 Sev can easily burn so better to fry them on medium heat. 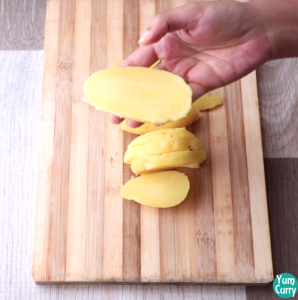 5.While boiling potato for Chaat don’t boil it too much else it will become difficult to slice them. If boiled potatoes are not hard, place them in the freezer for 15 minutes. 6. 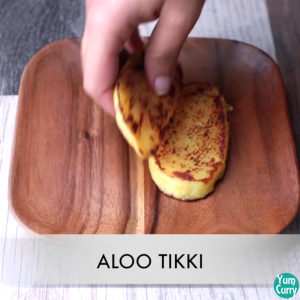 If unable to slice because potato is over cooked you can make tikkis with mashed potato. 7. Adding of spices is optional if you don’t eat any of the used spices in vrat or fast you can skip them.checkout the recipe of delicious chaat. 1/2 Tsp Cloves Crushed 7-8 cloves. 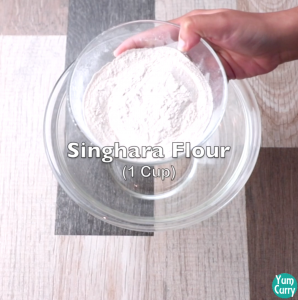 In mixing bowl add Singhara aata(water chestnut flour), chill powder, clove Powder,rock salt and 2 tsp oil. 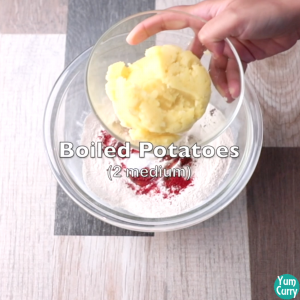 Mix all dry ingredient, now add 1 cup boiled - mashed potato to it. 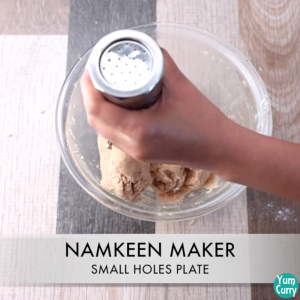 Mix all ingredient, add little water as needed to form a soft dough. We are making thin sev, so we require a plate with tiniest holes, grease the sev maker and plate, now place disk to the bottom of cylindrical sev makes. 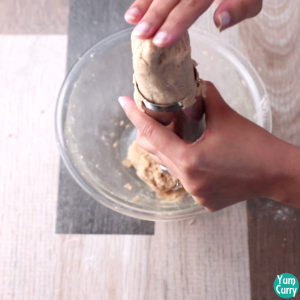 Take a portion of the dough, roll it in your greasy hands and gently place it into the sev maker and close it. 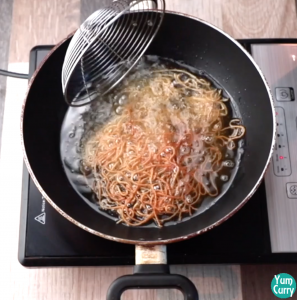 Heat oil in a pan and start pressing sev maker’s handle and pour the mixture directly into the hot oil ,as the thin strands of mixture starts coming out from disk slowly move machine in circular motion. Fry sev on medium heat and cook until it turns golden brown. 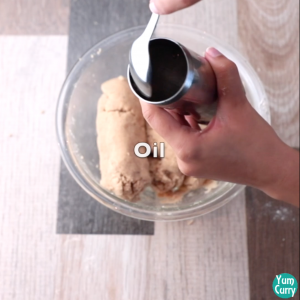 Take out sev into a kitchen towel to soak excess oil. Crispy singhara Sev is ready, you can enjoy singhara sev as snacks and can add in to any dish. For making green chutney, take handful of coriander leaves in a mixer. Add 2-3 green chillies, 1/4 cup roasted peanuts and rock salt to it. 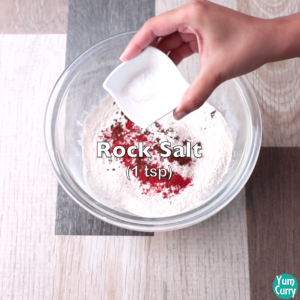 Blend it to make chutney and add few drops of lemon juice. 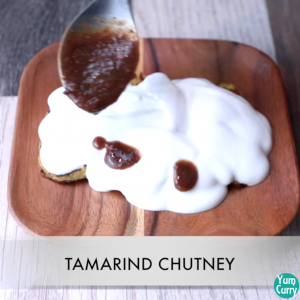 Tangy, spicy fresh chutney is ready. For making chaat Boil two large potatoes, don’t boil potato for long time for this recipe as we need hard boiled potato. Peel it and slice them vertically. 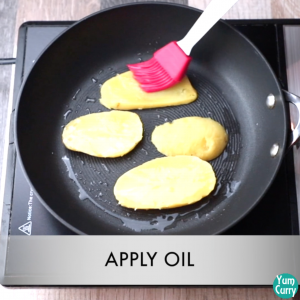 Heat a pan add ghee/oil to it, place the sliced potatoes on it and cook it on medium-high heat. 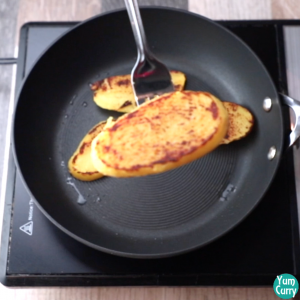 Flip the potato slices and fry it until golden brown from both sides. 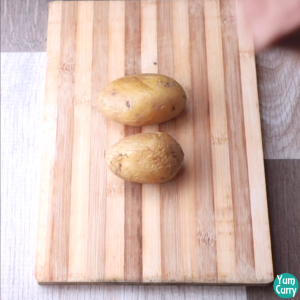 Take a serving bowl or a plate, layer 2-3 potato slices on it. 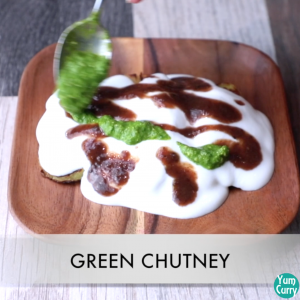 Start assembling all the other ingredient, top the potato slices with some dahi, Imli(tamarind) chutney, green chutney, rock salt, black rock salt, chilli powder and singhara Sev. Garnish it with fresh coriander leaves. Tangy , delicious, mouthwatering vrat ki chaat is ready. 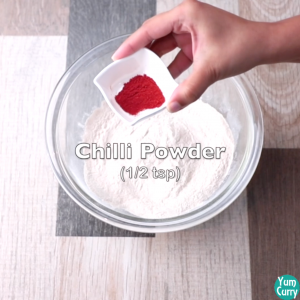 In a mixing bowl, add Singhara aata(water chestnut flour), chilli powder, clove Powder, rock salt and 2 tsp oil. 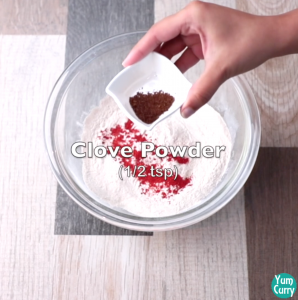 Mix all the dry ingredients, now add 1 cup boiled – mashed potatoes to it. We are making thin sev, so we require a plate with tiniest holes, grease the sev maker and plate, now place disk(plate) to the bottom of cylindrical sev makes. 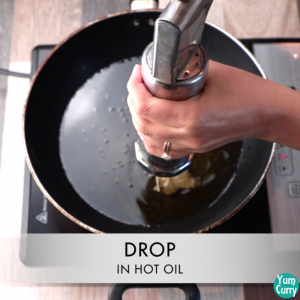 Heat oil in a pan and start pressing sev maker’s handle and pour the mixture directly into the hot oil ,as the thin strands of mixture starts coming out from disc slowly move machine in circular motion. 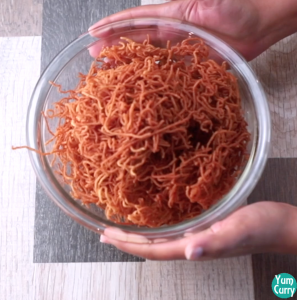 Fry sev on medium heat and cook until it turns golden brown. 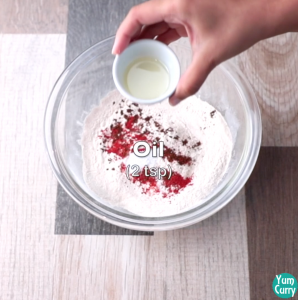 Take out sev into a kitchen towel to soak excess oil. Crispy singhara sev is ready, you can enjoy singhara sev as snacks and can add it into any dish. 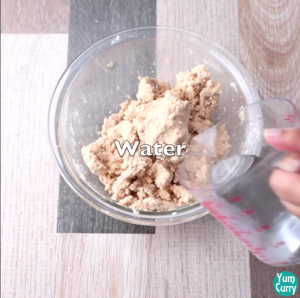 .Blend it to make chutney and add few drops of lemon juice.